Weekend Embroidery Finish…and a question! I wasn’t quite sure I’d finish the embroidery on Party in Provence this weekend, but due to the happy circumstances of rainy weather and not a whole lot going on, I put the last bead on at 6:59 yesterday evening! I was pretty pleased. The only drawback of an evening finish is getting the light right for photos. For some reason, daytime photos work better for me. So instead of setting up my amateur version of a photo shoot, I made do with my phone and my stitching light. I’ll take “real” photos later, after damp stretching and blocking the piece. If you’re just joining in here on Needle ‘n Thread, Party in Provence is an embroidered kaleidoscope design in a series I’ve been playing with for the past 10 months or so. I’ve finished three of them so far – this one, which I’m calling Tulip Festival (a shout out to ours here in Kansas) and this one, that I’m calling Octoberfest, even though I stitched it in November. So, about the name. Well, the design was partially inspired by fabrics from Provence that incorporate different elements. In those fabrics, you’ll often see stylized floral elements. Many of those floral elements will sport a hint of a “Jacobean” flair, which I didn’t really incorporate as part of the design structure as much as in the interpretation of the fillings. For the design structure, I stuck with simple stylized flowers, with a bit of a fleur-de-lis touch, too. You’ll also see a hint of the Indian design elements which influenced the fabrics and textiles in Europe when the whole cotton fabric industry was really getting underway. And of course, sunshine plays a huge role in Provence, resulting in an exuberance of growing things. The blues, the reds, the yellows and greens call to mind the rich color schemes that are often seen in fabrics from the region. So those were my thoughts while developing this particular design and interpretation. The “party” part? Well, with this series of kaleidoscope designs I’ve been dabbling with, I’ve tried to tie their names and their interpretations together under a main theme – in this case, celebrations. I’ve got a few other celebrations in the works, too! The whole design is about 7.5″ in diameter. I’m working on a partial interpretation of this design, too, to use as an embroidered pocket on the outside of a tote bag. I’ve written about that here. I plan to finish that (at least the embroidery part!) by tomorrow night. Hopefully, sewing the tote (not my forte!) will happen shortly thereafter. Besides the innumerable ways that you can interpret designs like this in stitches, another fun aspect of them is that you can break them down into sections. You don’t have to stitch The Whole Thing. The designs break up easily, especially if the design is an even number of sections – but even if it isn’t! I could see narrow slices of these designs worked, for example, down the front of a tie or a scarf. Ah, well…ideas, ideas! I’m still working on growing my octopus arms. I’ve had a lot of requests for the design for Party in Provence and the other kaleidoscopes I’ve shown you off and on. Which would you prefer: designs that you can interpret yourself, or designs and stitch guides based on my interpretation? Or the option for both? I’m always open to feedback! Feel free to chime in below! Would love to have your designs available with the stitch chart available as well. I am so unimaginative when it comes to selecting my own stitches. I do so much better with kits or guides. Party is Provence is stunning. I would prefer the design and stitch guide for how you interpreted it. I would like the option for both interpreting the kaleidoscope designs myself and making them based on your interpretations. That way I can use your version to inprove my skills and when I’m feeling confident, attempt my own interpretation. Thanks for all the wonderful inspiration and guidance you offer. What a beautiful piece! Your work amazes and inspires me. Thank you! Congratulations on a stunning finish Mary! The colors are so luminous–and very reminiscent of Provence. Very well done!! Please provide both possibilities. Your choices are so beautiful! And, maybe, I’ll be brave enough to try my own colorways at some point. Thank you! If I had a choice I would prefer one with the stitch guide. I know the work involved is greater on your part but it would be wonderful to recreate your piece. Apropos Party in Provence, since you’re offering :), I’d like to see both options: one for personal interpretation and one incorporating your thoughts and ideas. That’d be lovely! Hmmmm… Just the design? The design with directions? There’s no mention of the piece itself! A little while I back asked what you do with all the pieces you embroider and you said you give a lot of them away. If you happen to be in need of a recipient for THIS one……. I would prefer both – being very much a beginner, I find stitch guides help me learn new skills, but I imagine more experienced folks might want the design to interpret on their own. Love the colors and stitches! Would be interested in both options. For the more advance because they can add their own spin on it after they have seen your ideas. For beginners, because to give them the confidence in starting embroidery and to let them see embroidery can be a lot of fun and satisfaction. You have that wonderful gift to explain your embroidery skills in such a manner that it is not intimidating and will not scare newbies away. You make embroidery easy to understand and you are just the greatest teacher. You have always been one of mentors and thank you for that! I would l like options for both. I probably could incorporate my interpretation but it is always nice to have a starting point. Well done the embroidery for the tote bag is beautiful, it will look so nice on the bag I love the design and the colours you have chosen, I can’t wait to see the bag in all its glory. I think I would the choose the option for both as you have the choice to choose your own or use your interpretation. Thanks for sharing with us your completed tote embroidery project I can’t wait for the bag to be finished. Oh, I can’t wait, either, Anita – if I can actually manage it. You know, I’m rather a blunderer when it comes to machine sewing. I keep telling myself that I’ll only get better with practice, but working on a sewing machine always frustrates me! But I have High Hopes for this bag, if I can pull it off. We shall see! Hi….awesome finish….just wanted to ask, What about the centre blank? Sorry I may have missed it in previous posts, but just wondering what will go in there…. I’d love your interpretation of the designs, guides and the types of threads you used. Hi, Mary! I really enjoy your posts…fun and educational. 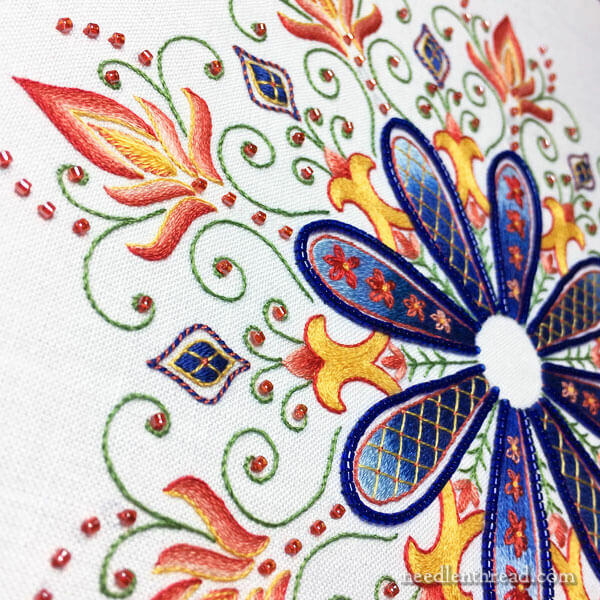 I absolutely LOVE this design but, if I were stitching it, I think I would want something in the center of the blue flower…maybe using a beautiful gold metallic thread. Your Party in Provence looks absolutely lovely!!! As for this design and other kaleidoscope designs…… perhaps a couple with both designs and stitch guides…. thinking of the beginners here, and then others could be just the design. I forgot to answer the question in my previous post. I would prefer having design plus stitch guide. Love this design concept.The mandala is great on it own framed or as part of a piece of clothing, a bag or a pillow.The colours for Party in Provence are wonderful! I worked your last kalidescope and loved it, will totally do that again when you release more. I appreciated the stitch guide, it helps us less experienced stitchers learn new things. The stitch guides look very time consuming to put together, and I would be fine if you let us know the stitches you used, but sent us to the web for detailed instructions. Your block is spectacular! Thank you for sharing all that you create! As to your question, I think both would be better. Mary, I would prefer your choice to pattern and stitches please. I do lack imagination and being fairly new to embroidery stitches I find my mind goes blank when provided with the pattern only. Thank you for your wonderful articles. A most enjoyable read! I would like a design and stitch guide to begin. So I may practice the stitches. Then move on to my own. Since I seem to always choose the same colors and stitches, the familiar is so easy, I would like to know how you came to choose the stitches and colors you did. Always helps to have another perspective. Your interpretation – I am not good at doing my own thing! Love these Mary. All are gorgeous. I like the rhythm of them and would imagine they are very satisfying to do. I would like both the design and your thread suggestions. I also think it would be a lovely project to do with all those many leftover threads just waiting to be used!!!!! I would love to have both the pattern and instructions. I did the coloris kaleidoscope you provided some months back in your colors. That gave me the encouragement to proceed with my own color scheme, but have not worked up to other stitches yet. Can’t think of any reason to mess with perfection. Thank you for all of your videos, you are a wonderful instructor and inspiration to keep going and exploring new things. I would like the design and stitch guide of how you interpreted it. Oooohhhh Mary, that’s luscious. For myself, I would prefer the pattern so I could put my own spin on it. So many possibilities… Different colours, beads, stitches. Visions of goldwork elements… A great project for guild challenges. I would also love to know how you go about constructing the patterns so they are geometric and symmetrical. Do you utilise cut and paste functions – manually or digitally. Sorry if you’ve talked about this already and I’ve missed it. I’ve wanted to do my own based on adult colouring books but have been daunted by the accuracy required to pull it off successfully. Thank you for the constant inspiration and education you continue to give your fans worldwide. I would prefer a stitch guide. Your needlework is stunning. I would hate to reinterpret your design and not have mine come out as amazing as yours. I have been stitching for 50 years and I know my limits. Thank you for inspiring me to keep stitching everyday. Would love your design with the stitch guide and colors. I’m a beginner to design and I would love to have something that could inspire me with choices. I would love to see both. A lot of times, I still have trouble putting colors together that look good. Your work is beautiful! My suggestion would be do 3 things. For one design show your planed stitching. Then for a second or even the one with the plan, talk about how you made the decisions. Then include just the designs for people to explore. I would love to be able to have your designs with your stitches, thread and color inspiration. This way I can still make it my own, but I have all your ideas to inspire me. I would like the pattern and stitch/ colours you have suggested,please. I’d like an option for both. I rarely do a design exactly as planned by the designer. The first design drew and taught, my co-teacher made changes. It was hard for me at first, but I believe that once you purchase a design, it is up to you to interpret how it is completed, including stitches, colors, floss choices, and beading. Stitch guides are helpful but ‘they are not the boss of me’. Oh, I want the Whole thing! Designs, stitch guide and thread choices. I love the color scheme. Beautiful , just beautiful! These are really pretty. It makes me wonder what you do will all of your embroideries? I enjoy stitching things for my home. I started cross stitching in the 90’s but after a while gave it up because you can only have so many pieces in your home and I ran out of friends to give them to. I have been working on a Spanish sampler for almost 20 years. I know but I am determined to get it done by the end of next year. I will frame it even the colors no longer go with my house. Your pieces are fun and very bright. How do you use them? I love your shopping bag project. Can you suggest other ways to use embroideries? I would prefer both. Your interpretation instructions and the possibility to put one’s own interpretation on it. Sometimes I need some inspiration to get started and also for the possibilities of all the variations. Please your designs and interpretations with your stitch guides would always be helpful. I would love to have both!Thx! Add me to the both column. Sometimes I want to think, sometimes I just want to stitch and that would give the option for both. I would love to have your designs with a stitch chart And any helpful hints on the stitching. I would go with the option for both. Love all the designs, especially the “Octoberfest” with the leaves! I would like the option for both. It a good learning exercise to see what you did and the color and stitch choices you made. But I also like the idea of being able to add my own variations. I love the design of Party in Provence – it’s so happy! With all the embroidery you do, what do you do with all your finished projects? One can have only so many pictures and pillows. Do you sell your work? I’ve quit some hobbies because there just wasn’t anyplace left to put the things I’d made. Beautiful work! If you sell these patterns i will be more than happy with any format. My very slight preference is for a version with a stitch guide, because no matter how much I think I know, I always learn something new from the way you present it. Your work is stunning … always. I much prefer having your designs available with your suggested stitches. I’m not even that confident in choosing colors, so any suggestions are very welcome. Thank you so much for all you do! Both please. That gives us an option to follow your suggestions and be creative ourselves. I think both options would be good. It would give you other ideas on your own project. You may see something that you think would in a different place for you. Also there are others that really need the guidance to sew the design. Personally I like to look at your designs and how you do them but chande them or interpret them in my colors or stitches or just do part or twist it differently. I love every thing you do because you are an inspiration to me. The way you break things down make me say I can tdo that with a little practice. Of course I’m not Mary Coebet but I can learn from her and show othiers. Thank you for everything. This kaleidoscopic is absolutely beautiful. Can’t wait for you to publish the designs AND stitch guides. Looking at the potential for 3 kaleidoscope designs I think the Both option is the most attractive. For example, I might prefer the stitch guide for the first I choose, but then with confidence move to design only for the next one. So – double the work across the board for you 🙂 These are all just lovely by the way. First up though – I have your Lattice Sampler. I would like the option for both. This is my favorite of the three Kalideoscopes. Love the colors, love the stitches, love the design. I would love to have the option of both. Using your guide would give me the feel of the design and start my creativity flowing. Then I can dive into my ideas and see what I can come up with. I just love the kaleidoscope type designs and yours are particularly nice. Where can I get a transferable copy of Party in Provence? Love the kaleidoscopes! Waiting anxiously for a book of the entire collection! I would love to have your designs available with the stitch guide. The Kaleidoscopes would be wonderful released as a set for a fee. Your original designs are beautiful and you should be paid for your creativity. Bravo!! Even before getting to the Question section, I was thinking “I hope she makes these a pattern or ebook someday!” I think the option for both the design and the guide gets my vote. I would like to see your design with stitch guide. Really like your work. Please, I would like to have your designs, the stitch chart and your choice of colors. Party in Provence is a delightful design that brings so much gaiety with these colors! I love “octoberfest” too, it seems easy to make for embroiderers very occupied elsewhere. Thank you so much for your anti-stress newsletter Mary. I’d like both, please. Then I can work it your way first, and if I manage that OK, I can go on to interpret it differently – I am nervous about designing/changing designs and think this would be a good way to ease myself into it! Designs and stitch guides based on your patterns. I like getting into the stitching more than trying to make my own interpretations. Plus I would pay extra for a pre-printed transfer since this pattern is a bit more complicated. Would love to have your design and stitch guide! Being fairly new coming back to needlework after … ummm … some time, I’d love the works for this one! It’s so beautiful and the colors just glow. Your passion and gorgeous work has been a big inspiration for me to get back to hand work. Thank you!! I prefer that you do the interpretation. Oh My Gosh!! I am breathless! Mary – – I love all your kaleidoscopes!!!!! Since I’m new’er to embroidery I would love any way you present the patterns, although designing my own is not presently in my skill set – LOL!! I can’t tell you how many times I’ve watched your videos on my iphone while practicing stitches. I’m hoping more of them go into long term memory (before my actual memory begins to fade with age -HaHa). Thanks for all you do; I’m inspired and encouraged. I would love the designs! The option for both sounds selfish and unoriginal on my part but it would give us some ideas for stitching our own versions. I would like the designs with the stitch chart as you interpreted it. Your work is just so beautiful – you are an inspiration! Thank you, Mary. Both, please. We stitchers are greedy, greedy……. I’d like to have both. I’m not good at all at choosing colors or stitches. You are so creative I love everything you do. I suggest you make another ebook out of it and just have us buy it. It would certainly be worth it to us and another revenue generator for you. Hope you’re doing well. Personally I prefer simpler less ornate designs that I can finish in a few nights. My time is really limited so I prefer things I can finish! I’d like to see some ornaments, embroidered jewelry and things I’d use. My wall space is all taken up. Love your newsletter and have referred others to it and mentioned it in the column I write for my EGA newsletter. Great finish! Can’t wait for Octoberfest! I’ll take it any way you publish it! Your such a bibliophile, that over the weekend I was at the library and came across a book you may really like. It’s called, “Imagine a Forest” by Dinara Mirtalipova. It’s folkloric art and really fun. Who knew? I just found her page at Etsy and another page with her website. What I really like about the book, is that it shows you how to draw some of her great ideas. 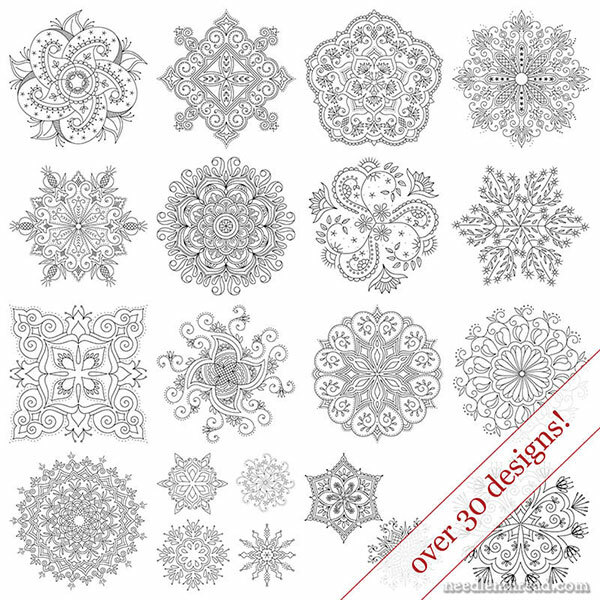 I can just imagine some of these in embroidery! I actually drew a horse! Yes, I can sew and embroider, but I can’t draw! Looking at your Kaleidoscopes just reminded me of folk art. Don’t you just love finishing something? Hi, Holly! I have that book – I like it! I’ve not used it a lot yet. It was a gift with some drawing stuff for my birthday, from friends who know I like to doodle. I think it’s fun! Yes, I like finishing projects….but I always feel a little at loose ends right after a finish! I have a gazillion other projects to delve into, so I never feel blue about finishing (I used to, when I didn’t have something to pick up right away). So, yes, happy to see something actually finished! I am not very good at interpreting. When I see something I like and I want to do it, I rarely change anything. I do what I see, that is why I wanted to do the project. So, I vote for your projects with your design interpretations. I love the Party in Provence. Congratulations on the finish piece it is stunning. I’m also a newbie at embroidery and still need expert advice, choice and options. So I would very much appreciate your version design and chart and color and etc. All things I would need to feel secure that I can also do this, as I mentioned before I am a determined beginner and I love this piece enough to turn it into a cover for my magnifying lamp that I got for christmas based on your recommendation. I use it with delight everyday but right now because I am working close to a sunny window I must put a piece of cardboard for safety measure. Imagine how beautiful she would look with the party in Provence instead!!!!! Party in Provence is a burst of design and color; it is just spectacular! I would love to embroider this and the others. I certainly would want the option for the one shown but the option for both would be excellent to satisfy every skill level. I am relatively new to your site; I am self taught using books and watching YouTube video postings done by Sarah Homfray. I have enjoyed watching them and have learned some new skills there. I have so much enjoyed and learned something new from everyone of your postings. Please don’t think of retiring any time soon. P. S. Your photo shots are great!! Both, please! I find that decision making is terribly time consuming so I really like having a detailed plan. On the other hand, I really hope designers don’t take it amiss when I deviate (sort of like I hope the chef doesn’t mind if I salt the potatoes). Beautiful design and the stitching is gorgeous! You did an absolutely fabulous job, Mary! I really have no preference in what you choose to share with us as anything that you do is just always so spot on. You are truly an inspiration. I think your readers would appreciate the option of getting both. sometimes having the original color schemes help when planing your own. The option for both of course! I would love the “both” option. Mary, your interpretations in embroidery are just beautiful but I too would like both options to maybe push me a bit further. As a rather inexperienced stitcher, I’d prefer to have your interpretation. It is absolutely gorgeous just as you stitched it! I would love the design and the stitch guide since I am a beginner embroidery stitcher. Love the kaleidoscope designs! I’d like to see the designs and stitch guides as you have done them. When I start a project, it really helps to have threads and stitch guides listed. It helps get me going! However once I start, I will usually change some things around to make it my own. This is just beautiful Mary. Bursting with life, with exquisite details. Yes I am hoping you will publish these for sale, and for the less color creative among us, I would prefer directions for your interpretations with them. If I’m feeling creative I can always change the colors or others elements once I have the design. But, your interpretation would be such a pleasure to stitch. Both ways. Love the Kaleidoscopes! I love your interpretations of the patterns you do. The colors you choose goes with the experience you have in your embroidery. I am thankful for any ideas you have. If I left it to my own choice I don’t think mine would be as lively, as I am a beginner again with embroidery haven’t done it since my 20ies (that’s awhile ago). Please continue to give your stitch guides with your projects. Always happy to read your posts. Both please! I’m not the only one who would happily buy an ebook. I know that’s a l0t more work for you, but it would give me so many more options. I may not stitch these particular designs following your stitch guide (I’m not good at following instructions), but a stitch guide could inspire me to try some of these techniques in other pieces of embroidery. I would LOVE to buy all of the kaleidoscope collection with your “exact” instructions. I think both would be best. For myself, I’d really like to follow your interpretations, but the option of doing your own thing is always good and I’m sure many people would like that. I’d vote for both as offering the basic design open to interpretation and the guide to a choice of colours and stitches. I love the Party in Provence lattices on the central motif – by looking at the enlargement the choice of couching is clear – but a reminder of the many other options would be welcome. This could just be a list. My mind plays with ideas of different patterns and I would like to do some sketches. I can also see working the design in a cool blue-green-purple colourway. I would love to be able to create this beautiful design using the colour chart and design instructions provided. I would love to have the option for both! Thank you! Options for both, of course!! these are such lovely pieces and look like so much fun to design, and to stitch. I think i see another ebook coming up……..lol! sign me up! by the way, what programming software are you using that makes the designs you offer be vectors? Was that clear as mud??? Pattern with stitching guide, I find that very helpful even if I decide to change some colors. Keep reading about this but don’t seem to find answer.. what thread did you use for center flower? A rayon? Hi, Laraine – No, it’s cotton. I don’t use rayon too often! Hello Mary, and thank you for all your wonderful posts. I’m a novice, albeit at 52, and would therefore prefer to have the stitch guide with the pattern, based on your interpretation. I could always opt for a simpler stitch if needs be, but guidance at this stage is great! Personally I would appreciate the option of both, but only if it was doable and not to time consuming for you. I would prefer the designs and stitch guides. I think that would be helpful for beginners or those who have only been stitching for a short time. I do love these. They are all beautiful in their own right! I hope one day to be somewhat as good at stitching as you are! Keep the newsletters coming I enjoy everyone of them! Always full of information and sooo much knowledge! Thank you for everything you do and sharing your knowledge with all of us! Stunning work as always Mary. I would be happy with the design as I like to do my own colors, etc. But will be happy with either. Another ideas for me would be to provide the design with list of colors and stitches used, but not detailed instructions. Would love the option for both if that’s ok, thanks for your lovely blog. Both, please! The colors you have used are beautiful! I vote for the option for both. I like the designs with your interpretations of how you stitched them and with what color, etc. Then if I don’t have the right threads, I can change them, but If I can’t think of what colors to stitch, etc, Your ideas will be so helpful!! Mary your kaleidoscopes are lovely. I would like the option for both, but also can you”teach” us how to interpret the patterns for stitching. I googled Kaleidoscope designs and when I look at them I just don’t know where to start. Thanks for all the work you do for us. Well, I always feel safer if the complete methods are included – not that I always keep exactly to them, but knowing they are there gives me security! I just want to tell you how much I love your designs. I don’t really enjoy working with other people’s designs, I prefer to create my own, but I really do love your work and I have learned so much from your site. Thank-you for all you share. A design with stitch guide please as that will give folks both options. Those who don’t want the stitch guide can ignore it, while those who do want the guide will have it. Thank you for sharing this piece. I love its colors. I really love the pattern and your interpretation! No surprise I prefer designs and stitch guides based on your interpretation. It will give me some convenience as a starting point of my own interpretation. I would like to have your directions. I am not good with that part. The design is lovely. Option for both, I think. Although I doubt that my ideas could ever be lovelier than yours. Your stitch guides and color choices make it easy for those who are not good at designing for themselves. Those of us who are more daring or more confident in trying other stitches will change the colors or adapt their own stitch choices as they desire regardless of what you puot on paper. Thanks for asking, I love kits so I don’t have to think too hard, but can enjoy the stitching when I get the chance. I really LOVE your Party in Provence. I’d take it any way!! It would be easy to use just the parts I want to use. I so appreciate all of your free designs. Thank you!! I’d love to get all the information possible! Since my crewel work is extremely limited, I would NEED the stitch guide. At this point, I haven’t got the experience from which to draw the stitches. I like to see your versions as you have such great colour choices but also like to do my own things. Both options would be nice. I’m a follow the instructions kind of stitcher….and I love your choices so would love it if your interpretations were available… but I know lots of stitchers prefer to do their own thing so probably offering both options would be best, and I do have to say … I LOVE this one!! Being fairly inexperienced I prefer your advice Mary. You have vision for details that I do not yet realize exist. This gal prefers Your Design & Stitch guides. I can always change things later if I choose to do so! Thanks. I have fallen in love with Party in Provence. I would love a pattern just as you have done it, as soon as possible. But having options would be nice too. Thank you for your wonderful website; I always look forward to your emails. I love it! I can’t wait for the photo shoot! As for sharing them with us, I love a freebie, so I guess a free digital pattern without the frills. As a person that has always bought Kits, I find it hard to say I could I would prefer both. I will say I find “ALL OF YOUR CHOICES” magnificent both for pattern and colors. The one you have shown on this post is awesome. So thank you for all your beautiful works as I love logging on and seeing it all….always in awe. No question Mary just a big thankyou for the wonderful stuff you do,Ido so wish I was as clever as you.–Keep up the good work,myou cheer me up every day. Tnank and God Bless. M.
I would love to see the design with the original stitch guide you used. Changes could come as the design is worked by the stitcher but the original is just gorgeous. I would stitch it as is. Thanks for the beautiful work! Mary Ann – Cincinnati. I would prefer to have the designs and interpretations based on your interpretation. You are definitely the expert!! And while I love embroidery, I’m still too new at it to selecting stitches and colors myself. Love love love the Octoberfest! The colors are luscious! I would love the pattern for this, with your instructions. I almost always modify things that I am working on, but your instructions would be immensely helpful as a starting point. 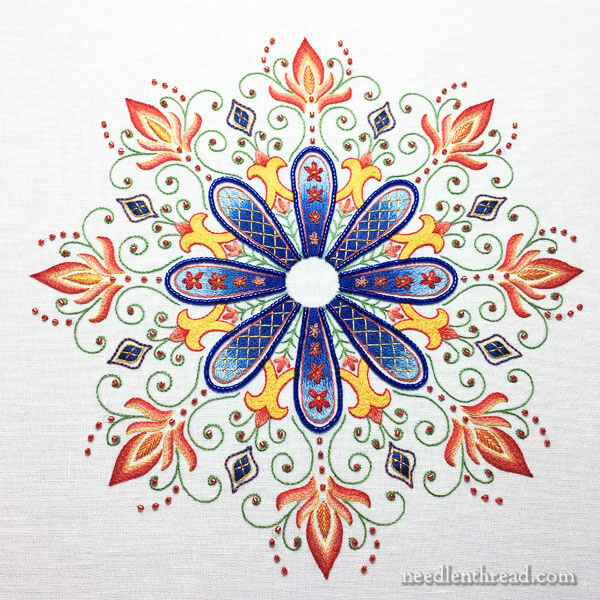 Have you thought about digitizing this for machine embroidery? Hi, Donna – Thanks for your question! No, I haven’t. I don’t know too much about machine embroidery digitizing, as I concentrate on hand embroidery. 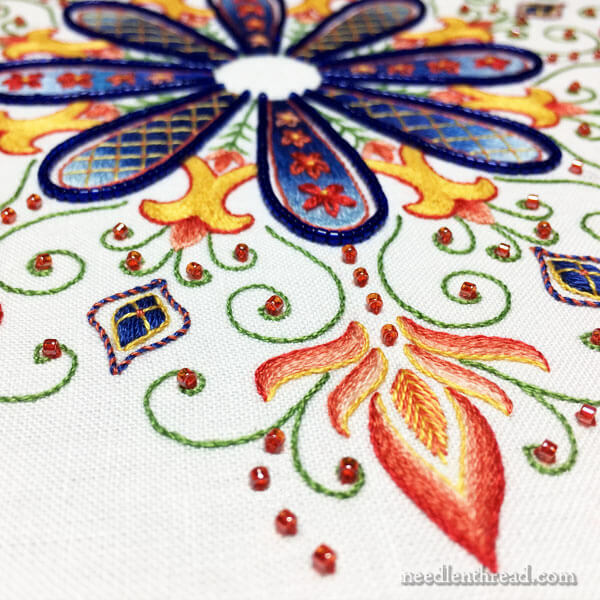 The most machine embroidery I’ve ever done is lines of decorative stitches on the edge of something – not really “proper” digitized machine embroidery, but just the decorative stitch options on a Bernina. I love the design and the colors you have chosen. It will make a great pillow cover with blue piping. I am all for your design and instructions. It is a keeper. Kaleidoscope. Oh BOTH, of course! The completed project is just lovely and the beading adds a wonderful beauty. Thank you so much for your passion for needlework of all types and ages. Hi Mary, Absolutely beautiful! To add my thoughts re design and stitch guide, like many others I think the option for both would be great. I love the idea of using a bit of creative individuality but I often find that when I’m starting out I get stuck on stitch choices (sometimes the choices and possibilities just seem SO overwhelming). Perhaps by completing a few and following your stitch suggestions I’ll eventually get “a feel” for what stitches ‘work’ and then gain a bit of confidence to give a design a bit of my own interpretation. Hope my input is not too late. The kaleidoscope in the gorgeous deep blue and bright oranges is so, so beautiful. Wld love to do it up, using your choice of colors. Thank u ,Mary, for your delightful blog. Hope your health is improving. I love the piece. I also love that you are making it into a functional totebag. Lately i have bben questioning my embroidery passion as i have LOTS of finshed pieces that are framed pictures. I have run out of walls. What more can we do with these pieces we create since some are goldwork and are not suitable for clothing. I like your October Fest, its design simplicity appeals to me, easily adapted to different projects. I’m already thinking of a beading project. I must say that I thoroughly enjoy your site. I have never commented on your newsletter. But I must say that it gives me so much pleasure and joy. I have recommended your site to so so many people. At The Embroiderers Guild of South Australia and to the many stitching groups that I belong to. They have in turn read and watched your youtube videos as well. You and your site are so amazingly helpful. Continue the fabulous work you do. I am in LOVE with this design! And I’m hoping you will be offering it for sale in your shop! I can’t wait to see the next one and the next and….well you know! The colors you chose are perfect, you have the eye for color and what’s going to blend and or pop! I’ll get there in time? I read every email and every post, thank you for educating all of us! The option for both! Please! These are absolutely beautiful! Hello Mary, I am new and I’m absolutely loving what you are doing. Thank you so much for sharing your designs and ideas. I’ve been stitching most of my life, primarily cross stitch and needle point. I’m now consumed with embroidery and loving it. Please let me know how I can get the designs and stitch guides. I’m loving the Birthday Bash and cant wait to stitch it myself. THANK YOU FOR SHARING YOUR TALENT! The others are coming out, in one format or another, soon! Love, love, love your design interpretation and colors!! Can you please post the fabric and color chart for at least the Party in Provence, Tulip Festival and Octoberfest? Hi, Debbie – Glad you like it! Octoberfest is its own separate project guide in my shop. I’ll be posting Tulip Festival in a short series here on the website next! This design you stitched is stunning, the colors you chose is amazing. I love your interpretation on the colors. Where is this pattern in the Favorite Kaleidoscopes collection? I can’t seem to locate it. My favorite flower is the Daisy and this would be beautiful on the back of a denim jacket. Hi, Jane – I’ll be covering Party in Provence step by step on the website here. The first article went up today! I have to embroider words on top of a space filled with split stitch. The area is small: about 3/8’s by 1.5 inches. The split stitch is pale and the letters will be black. There are 2 such spaces. One will say, “Santa’s” and the other “fire dept.”. The words obviously are going on freehand and I do not do that very well. Can you advise me please? Thank you for any help you give. Hi, Deana – Ahh, that is a tiny space! I would probably embroider the letters first (in split stitch) in black and then split stitch around them with the pale color. Here’s a group of lessons on stitching embroidered lettering and text. There’s one specifically on split stitch. https://www.needlenthread.com/2009/10/hand-embroidery-lettering-and-text.html Hope that helps! The word “Stunning” would be an understatement! This piece is astonishing! Beautiful! and many more descriptive words!! I would love it if you could combine designs and stitch guides based on your interpretation AND be able to design my own. I’m new to needlework, and my imagination is much more advanced than my skill!! Excellent Pattern Collection! I have some clients looking for stock embroidery patterns off an on. I will definitely recommend you! I would prefer both actually then I can improve my skills from your work to along with definitely a stitch pattern. Love the work it’s stunning!